30 Year Thang Tour selling fast, new shows added! 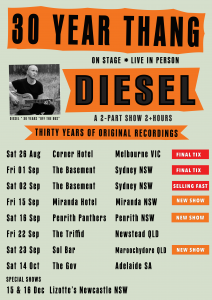 Tickets are selling fast to Diesel’s 30 Year Thang Tour at Corner Hotel (VIC) and Basement Sydney (NSW), with new shows added at Miranda Hotel (NSW)​, Penrith Panthers (NSW)​ and Solbar​ (QLD)! Don’t miss Diesel & his band LIVE performing tracks from his 30 year career to date. Full Band Shows | Tickets on sale now!